In this study, nucleolus organizer regions of Cyprinion macrostomus were investigated. The diploid number of chromosomes of this species was 2n=50 consisting of three pairs of metacentric, 12 pairs of submetacentric, six pairs of subtelocentric and four pairs of acrocentric chromosomes. The nucleolus organizer regions were detected at the end of the short arms of two pairs of medium sized submetacentric chromosomes. Nucleolus organizer region patterns were nearly identical with what that found in most other representatives of the Eurasian Cyprinids. Nucleolus organizer regions (NORs) are generally determined by metaphase and interphase chromosomes. Silver staining stains acidic proteins, which are associated with fibrillary structure of the NORs, indicate only transcriptional rDNAs. NORs on homologous and/or non-homologous chromosomes may vary in size. It is reported that this variation in the size of NORs results from cistron numbers and differences in transcriptional activity (Galetti et al., 1984). The variation concerned may influence the number of NOR, their localization on the chromosome, their size, and active numbers in each genome (Ozouf-Costaz, 1992). NORs are used as markers to indicate intra- and inter-species chromosomal polymorphism in many groups of fish (Amemiya and Gold, 1990; Rab et al., 1996; Rab et al., 2000). While generally there is a variation in NOR number between species, NOR number may vary among the individuals in Cyprinids and Salmonids (Amemiya and Gold, 1990). Until today, the NOR studies on Cyprinids have been conducted by Pekol (1999, 2003, 2006) and Gaffaroglu et al. (2006) in Turkey. Our study reports chromosomal distribution of NORs, NOR number and morphologies in Cyprinion macrostomus, of the cyprinids in Turkey. In addition, NOR characteristics in European cyprinids and their evolutionary relations are discussed. The samples (seven female and five male) were collected between 2001-2003 from Karakaya Dam Lake (38º 27' 23.06" N, 38º 32' 17.47" E, 38º 28' 47.24" N, 38º 25' 55.24" E and 38º 29' 27.46" N, 38º 20' 23.82" E), Malatya, Turkey. The fish were transported alive to the laboratory and kept in well aerated aquaria until analysis. Mitotic chromosome preparations were obtained from fish kidneys using “air-drying” technique of Collares- Pereira (1992). Silver staining technique of Howell and Black (1980) was used in NOR analysis. Chromosomes were classified according to Levan et al. (1964). The specimens analyzed are deposited in the Cytogenetics Laboratory of the Department of Biology, Faculty of Science and Arts, University of Ahi Evran, 40200 Kirsehir, Turkey, M. Gaffaroglu (M.G. 20). NOR localizations in C. macrostomus are presented in Figure 1. Number of diploid chromosomes were 2n=50, of which three pairs were metacentric (M), 12 pairs were submetacentric (SM), six pairs were subtelocentric (ST) and four pairs were acrocentric (A), and NF=92. NOR was observed at the end of the short arms of two pairs of medium-sized SM chromosomes. Figure 1. 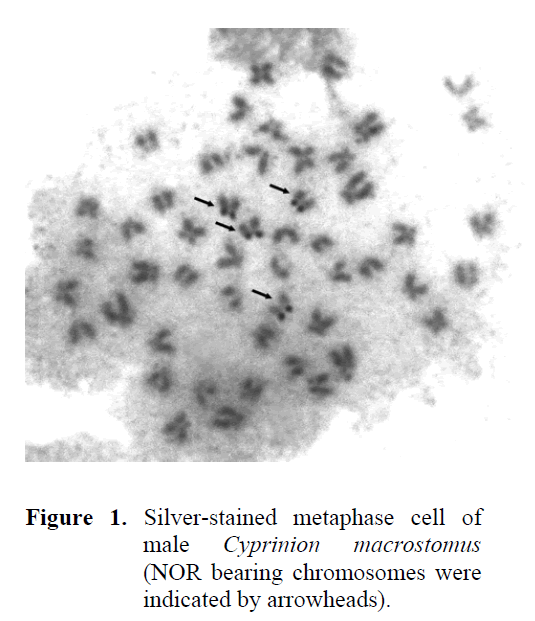 Silver-stained metaphase cell of male Cyprinion macrostomus (NOR bearing chromosomes were indicated by arrowheads). Pekol (1999) reported that two different populations of Cyprinus carpio and Leuciscus cephalus had three distinct NOR phenotypes. He noted that the most common phenotypes were localized at the end of the short arms of a pair of SM chromosomes in Beyler population and on the short arms of a pair of M-SM chromosomes in Germectepe population of C. carpio, whereas on a pair of ST-A chromosome in Beyler population and on a pair of SM or A chromosome in Germectepe population of L. cephalus. NOR can be found on the short arm, long arm or in the regions close to the centromere of the chromosome. NOR number may range between one pair and eight. Although NOR is seen generally at the end of the short arms of ST and SM chromosomes, they may also sometimes be seen at the end of the long arms of SM and ST chromosomes, on the arms of M and A chromosomes, as well as between telomere and centromeres, or adjacent to the centromer (Galetti et al., 1984). It was reported that NOR was found at the end of the short arms of an SM and an ST chromosome in Notropis ardens species (Gold and Amemiya, 1986), at the end of the short arms of a pair of medium-sized SM chromosomes of Cobitis taenia (Boron, 1995), at the end of the short arm of a medium-sized SM chromosome and at the end of the short arm of a large ST-A chromosome of Pimephales signipinnis and P. welaka (Amemiya and Gold, 1990), at the end of the short arms of two SM chromosomes of Silurus glanis (Rab et al., 1991), at the end of the short arm of two small SM chromosomes of Capros aper (Vitturi and Lafargue, 1992), on an M-SM chromosome of Leporinus lacustrite, at the end of two SM chromosomes of L. elongates (Galetti et al., 1984), and at the end of the armes of a pair of M chromosomes and at the end of the long arms of a pair of SM chromosomes of Huso huso (Fontana et al., 1998). In our study, NOR was found on submetacentric chromosomes, too. Our examination did not show any interspecies variation between homologous and non-homologous chromosomes and their arms in terms of NOR size. A polymorphism was found in inter-species NOR number. In addition to chromosomes with two pairs of NOR, metaphases with one pair or three pairs of NOR or without NOR were also observed. Amemiya, C.T., Gold, J.R. (1990). Cytogenetic studies in the North American minnows (Cyprinidae), Hereditas, 112: 231-247. Boron, A. (1995). Chromosome banding studies of spined loach Cobitistaenia(L.), Cytobios, 81: 97-102. Collares-Pereira, M.J. (1992). First InternatioaWorkshop on Fish Cytogenetic Techniques, Concarneau, France, 14-24 September. 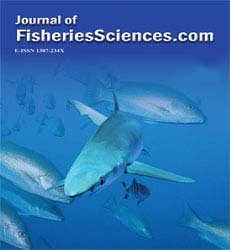 Fontana, F., Tagliavini, J., Congui, L., Lanfredi, M., Chicca, M., Laurente, C., Rossi, R. (1998).Karyotypic characterization of the great sturgeon, Husohuso, by multiple staining techniques and flourescent in situhybridization, Marine Biology, 132: 495-501. Galetti, P.M., Foresti, F., Bertollo, L.A.C., Moreria, F.O. (1984). Characterization of Eight Species of Anostomidae (Cypriniformes) Fish on the Basis of the NucleolarOrganizing Region, Caryologia, 37: (4) 401-406. Gold, J.R., Amemiya, C.T. (1986). Cytogenetic Studies in North American minnows (Cyprinidae) XII. Patterns of Chromosomal Nucleolus Organizer Region Variation Among 14 Species, Canadian Journal ofZoology, 64: 1869-1877. Howell, W.M., Black, D.A. (1980). Controlled Silver Staining of Nucleolus Organizer Regions with a Protective Colloidal Developer: a1-Step Method, Experientia, 36: 1014-1015. Levan, A., Fredga, K., Sandberg, A.A. (1964). Nomenclature for Centromeric Position on Chromosomes, Hereditas, 52: 201-220. Pekol, S. (1999). KastamonuBeylerveGermeçtepeBarajlarindakiCyprinuscarpio(L., 1758) veLeuciscuscephalus(L.,1758) populasyonlarininkarsilastirmalikaryotipanalizive nor fenotipleri, DoktoraTezi, DanismanKuru M., Gazi Üniversitesi, Fen BilimleriEnstitüsü, Ankara. Pekol, S. (2003). KastamonuBeylerBarajindakCyprinuscarpio(L., 1758) populasyonununNOR fenotipi, KastamonuEgitimDergisi, 11: (1) 183-192. Pekol, S. (2006).KastamonuBeylerveGermeçtepeBarajlarindakiCyprinuscarpio (L., 1758) populasyonlarininkarsilastirmaliNOR fenotipi, KastamonuEgitimDergisi, 14: (1) 185-194. 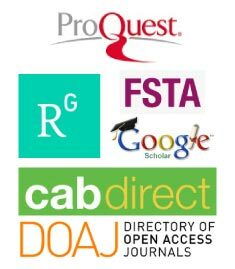 Rab, P., Karakousis, Y., Rabova, M. (1996). Karyotype, NOR phenotype and CBandingstudy of Barbuscyclolepisfrom Greece, Folia Zoology, 45: 77-83. Rab, P., Machordom, A., Rabova, M., Doadrio, I. (2000). Karyotype of African bariliinefish Raimassteindachneri(Osteichthyes, Cyprinidae), Folia Zoology, 49: 75-80. Rab, P., Mayr, B., Roth, P. (1991). Chromosome banding study of European Catfish, Silurusglanis(Pisces, Siluridae), Chromosoma, 83: 153-157. Vitturi, R., Lafargue, F. (1992). Karyotypes analyses reveal inter-individual polymorphism and association of nucleolus- organizer-carrying chromosomes in Caprosaper(Pisces: Zeiformes), MarineBiology, 112: 37-41.